This news item was posted in M, Mouth, Skin category and has 1 Comment so far. Infectious Mononucleosis is a viral disease caused by the Epstein-Barr virus (EBV). The virus is spread through saliva (reason it is sometimes known as the kissing disease), and in rare instances through blood transfusion. Infectious Mononucleosis is mostly diagnosed in adolescents and young adults, mostly in the age groups of 15 to 17. As its name suggests, it is an illness in which the patient initially has some degree of fever and generally some enlargement and tenderness in the glands of the neck, and probably in the armpits and groin. It is an infectious disease and more apt to affect children and young adults. More often than not children appear to take it lightly, but it can sometimes cause young adults to be quite ill for several weeks. Most frequently glandular fever starts with a sore throat occasionally accompanied by that sensation of aching tiredness that so often accompanies flu. The sore throat may not last more than a week, and there can also be a rash during this stage and quite high temperature. This raised temperature seldom lasts long in children, but again with young adults, though the temperature may not remain as high as at the start, it can sometimes linger on for a few weeks. In the more severe cases there can be abdominal discomfort, enlargement of the spleen and even jaundice if the liver has been affected. Glandular fever is caused by the Epstein-Barr virus. This can attack only two types of cells in the body: those in the salivary glands and white blood cells known as B lymphocytes (B-cells). Infection begins in the salivary glands, which release large amounts of the virus into the saliva. The infection spreads to the B lymphocytes, causing them to multiply, and causing the lymph glands to swell and become painful. Once infected, the virus remains dormant in the body’s cells for the rest of a person’s life. Naturally, from the onset, regular medical attention is needed. The doctor will probably take blood tests for pathological examination, first to confirm the diagnosis and then to follow the progress towards recovery. Since glandular fever is a viral infection, there’s no specific treatment. Pain relief and fever treatments (including paracetamol or ibuprofen), fluids and rest are important to help overcome the infection. Antibiotics aren’t needed and can trigger a rash in this condition. Because of the lingering-on tendency in some patients, glandular fever can be a very tedious illness for the patient, during both the feverish period and convalescence. And occasionally for some months after, it can leave a legacy of bouts of depression and unusual tiredness. During these aftermath months many doctors advise young adults to avoid all forms of alcohol. Those who decide to ignore this advice often discover that, as a result, they feel quite ill again. Fortunately, this stage is seldom long-lasting and generally a full recovery is made. Glandular fever has an unofficial name — the ‘kissing disease’. Probably this has come about since the illness so often occurs in young people and is an infection that can be contacted by kissing someone who may be unwittingly harboring the illness but perhaps is not feeling quite ill enough to miss a good party! Infectious Mononucleosis is also known by the following names. When in its initial stages Mononucleosis symptoms could include one or more of the following. These initial symptoms last from 1 to 3 days after which the following more pronounced symptoms appear. Usually the sore throat is so severe that the person is forced to visit the physician. Signs of Mononucleosis could include one or more of the following. The symptoms of Infectious Mononucleosis will usually resolve within a month or two, but the EBV could remain dormant in a few cells of the throat or in the blood for life. Most of the persons who have had Infectious Mononucleosis once are not at risk of the infection again when they come in contact with someone who could spread it. It is believed that the spread of Infectious Mononucleosis is rare through blood or saliva in the air (coughing, sneezing), and requires a more direct contact with the infected saliva. The time from infection to appearance of the symptoms (incubation period) varies from 4 to 6 weeks. 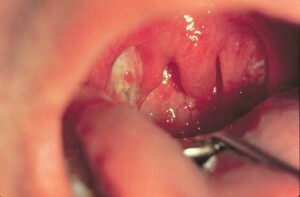 Persons infected could spread Infectious Mononucleosis even during this period without knowing it. The culprit virus is also sometimes found in perfectly healthy persons from where it can spread to others. Due to these reasons, containing the virus and infection is not possible. Diagnosis of Infectious Mononucleosis is usually based on reported symptoms along with a physical examination. If there is doubt in the physicians mind, a white blood cell count or an antibody test could be conducted. The common tests for EBV could include one or more of the following. The treatment usually adapted for Infectious Mononucleosis consists of corticosteroids for reducing the swelling of the throat and tonsils. Besides this sufficient rest is advised so as to facilitate the body’s immune system to destroy the virus and regain lost strength. During this time the symptoms can be relived by a warm water gargle to relieve the sore throat, and drinking plenty of warm fluids. In most of the cases of Infectious Mononucleosis there is no need to worry. The fever should go within 10 days and the swollen lymph glands and spleen (if swollen) should heal perfectly within 4 to 5 weeks. If you are aware that someone close to you is infected with ‘mono’, avoid kissing (even a mild peck) and sharing the same utensils; you may just save yourself from contracting the Infectious Mononucleosis.